The main goal of the Nanoscale bioelectrical characterization group is to develop new experimental setups based on atomic force microscopy and new theoretical frameworks enabling the quantification of the electrical properties of biological systems at the nanoscale (including biomembranes, single viruses, single bacteria cells and eukaryotic cells). 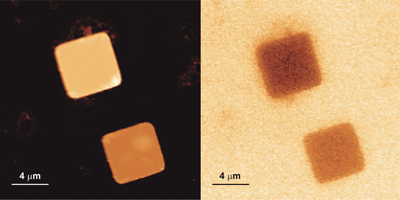 Above: AFM Topographic (left) and Electrostatic Force Microscopy dielectric (right) images of two microfabricated pillars of Al3O2 (95 nm thick, top) and of SiO2 (60 nm thick, bottom) on a gold substrate, obtained in a liquid environment. The dielectric image (right) shows an inverted contrast (higher electric force on the substrate than on the pillars) due to the higher electric permittivity of the surrounding liquid medium (water) with respect to that of the pillars. Our main objective is to contribute to develop new label-free biological nanoscale characterization methods and new electronic biosensors. During 2017 we have completed our studies on the measurement of the local electromagnetic properties of materials in the high frequency range (>GHz) with the use of the Scanning Microwave Microscope. In particular, we have developed a method to map directly the electric permittivity of non-planar heterogeneous samples by means of a Scanning Microwave Microscope, and, contributed to the development of a full electromagnetic modelling of this microscope. 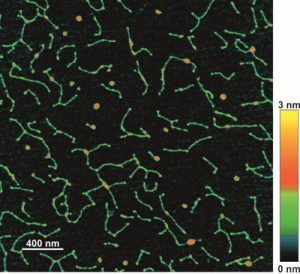 Right: Atomic Force Microscopy topographic (left) and Electrostatic Force Microscopy dielectric (right) images of a bacterial polar flagellum of 10 nm in diameter obtained in air. The use of 3D finite element numerical simulations enables the quantification of the dielectric image and the extraction of the dielectric constant of the proteins composing the bacterial polar flagellum (sample prepared by Eduard Torrents’ group at IBEC). On the other side, we have made experimental and theoretical advances towards extending the use of Electrostatic Force Microscopy in the liquid environment, in order to be able to probe the dielectric properties of biosamples in physiological conditions. Finally, we have developed methods to probe the dielectric properties of small scale filamentous protein structures and applied them to the dielectric characterization of bacterial polar flagella. During this year, also, we have optimized sample preparation and imaging methods to image protein-DNA complexes with the Atomic Force Microscope, and started new research projects devoted to the study of the electrical properties of electrogenic bacteria, nanopore systems, single neurons and organic electronic devices, which are currently under development. Left: Atomic Force Microscopy image of DNA molecules complexed with AlgR proteins. The DNA molecules are 2 nm high and appear as green, while the proteins are around 3 nm high and appear as red spots in the DNA molecules. The DNA molecules tend to bent around the positions where the proteins are complexed with the DNA (sample prepared by the group of Dr. E. Torrents, IBEC). The Nanoscale Biolectrical Characterization group has been awarded EU funding to coordinate a project that aims to train a new generation of researchers in the science and technology of Scanning Probe Microscopes. The Nanoscale Biolectrical Characterization group is looking for a Early Stage Researcher (PhD student) to develop his/her PhD thesis project on the development of a novel Nano-tomographic technique based on electrostatic force microscopy. The Nanoscale Biolectrical Characterization group is looking for a Early Stage Researcher (PhD student) to develop his/her PhD thesis project on the label-free mapping of biological membranes’ composition with nanoscale spatial resolution. An IBEC group has demonstrated, for the first time, that the hydration properties of a single bacterial endospore in varying environmental relative humidity can be determined with high accuracy and reproducibility, and in a non-destructive way, shedding new light on endospore survival strategies. Researchers at IBEC and their collaborators from the Johannes Kepler University of Linz, The University of Manchester and the company Keysight Technologies have now achieved an elusive goal: to measure the electromagnetic properties of biological materials at the level of a single bacterial cell and at very high frequencies (gigahertz). Having measured the electric polarizability of DNA – a fundamental property that directly influences its biological functions – for the first time ever last year, IBEC´s Nanoscale Bioelectrical Characterization group has made a further breakthrough in the understanding of the dielectric properties of cell constituents by measuring the electric polarizability of the main components of the cell membrane – namely lipids, sterols and proteins – with a spatial resolution down to 50nm. Gabriel Gomila, IBEC group leader and Associate Professor at the UB, has received an ICREA Academia Prize 2014 for excellence in research and capacity for leadership. The electric polarizability of DNA is a fundamental property that directly influences its biological functions. Despite the importance of this property, however, its measurement has remained elusive so far. In a study published in PNAS today, researchers at Barcelona’s Institute for Bioengineering of Catalonia (IBEC) led by Laura Fumagalli, senior researcher at IBEC and lecturer at the University of Barcelona, and their collaborators at the Institute for Research in Biomedicine (IRB) and at Barcelona Supercomputing Center (BSC), and at Centro Nacional de Biotecnologia (CNB-CSIC) and IMDEA Nanociencia in Madrid, describe how they have found a way to directly measure DNA electric polarizability – represented by its dielectric constant, which indicates how a material reacts to an applied electric field – for the first time ever. The latest article published by IBEC’s Nanoscale bioelectrical characterization group has made the cover of the journal Nanotechnology. A new European Marie Curie Initial Training Network involving IBEC’s Nanoscale Bioelectrical Characterization group will attempt to bring research into microwaves – which are extensively used in a host of applications such as telecommunications, microwave ovens and radar – to a whole new level. Scientists at IBEC in Barcelona have found a way of effectively identifying nanoscale objects and viruses that could offer a breakthrough for biomedical diagnostics, environmental protection and nano-electronics. IBEC’s Nanoscale Bioelectrical Characterization group, headed by Gabriel Gomila, is a partner in a new EU-funded collaborative project set to develop a new tool for non-destructive 3D nanoscale structural characterization, the Volumetric Scanning Microwave Microscope (VSMM). Gabriel Gomila and Laura Fumagalli, from the Nanoscale bioelectrical characterization line at IBEC, are two of the authors of the study. Theoretical studies predict that the inhibition of rotational motion of water near a solid surface will decrease its local dielectric constant. Fumagalli et al. fabricated thin channels in insulating hexagonal boron nitride on top of conducting graphene layers (see the Perspective by Kalinin). The channels, which varied in height from 1 to 300 nanometers, were filled with water and capped with a boron nitride layer. Modeling of the capacitance measurements made with an atomic force microscope tip revealed a surface-layer dielectric constant of 2, compared with the bulk value of 80 for water.Science, this issue p. 1339; see also p. 1302The dielectric constant Îµ of interfacial water has been predicted to be smaller than that of bulk water (Îµ â‰ˆ 80) because the rotational freedom of water dipoles is expected to decrease near surfaces, yet experimental evidence is lacking. We report local capacitance measurements for water confined between two atomically flat walls separated by various distances down to 1 nanometer. Our experiments reveal the presence of an interfacial layer with vanishingly small polarization such that its out-of-plane Îµ is only ~2. The electrically dead layer is found to be two to three molecules thick. These results provide much-needed feedback for theories describing water-mediated surface interactions and the behavior of interfacial water, and show a way to investigate the dielectric properties of other fluids and solids under extreme confinement. In this study, we show that dry saturated phospholipid layers prepared by the spin-coating technique could present thinner regions associated to interdigitated phases under some conditions. The morphological characteristics of lipid layers of saturated phosphocholines, such as dilauroylphosphatidylcholine (DLPC), dimyristoylphosphatidylcholine (DMPC), dipalmitoylphosphatidylcholine (DPPC) and distearoylphosphatidylcholine (DSPC), have been measured by Atomic Force Microscopy and revealed that the presence of interdigitated regions is not induced by the same parameters that induce them in hydrated samples. To achieve these results the effect of the lipid hidrocabonated chain length, the presence of alcohol in the coating solution, the spinning velocity and the presence of cholesterol were tested. We showed that DPPC and DSPC bilayers, on the one side, can show structures with similar height than interdigitated regions observed in hydrated samples, while, on the other side, DLPC and DMPC tend to show no evidence of interdigitation. Results indicate that the presence of interdigitated areas is due to the presence of lateral tensions and, hence, that they can be eliminated by releasing these tensions by, for instance, the addition of cholesterol. These results demonstrate that interdigitation in lipid layers is a rather general phenomena and can be observed in lipid bilayers in dry conditions. A three-dimensional finite element numerical modeling for the scanning microwave microscopy (SMM) setup is applied to study the full-wave quantification of the local material properties of samples. The modeling takes into account the radiation and scattering losses of the nano-sized probe neglected in previous models based on low-frequency assumptions. The scanning techniques of approach curves and constant height are implemented. In addition, we conclude that the SMM has the potential for use as a broadband dielectric spectroscopy operating at higher frequencies up to THz. The results demonstrate the accuracy of previous models. We draw conclusions in light of the experimental results. We obtained maps of the electric permittivity at ~19 GHz frequencies on non-planar thin film heterogeneous samples by means of combined atomic force-scanning microwave microscopy (AFM-SMM). We show that the electric permittivity maps can be obtained directly from the capacitance images acquired in contact mode, after removing the topographic cross-talk effects. This result demonstrates the possibility to identify the electric permittivity of different materials in a thin film sample irrespectively of their thickness by just direct imaging and processing. We show, in addition, that quantitative maps of the electric permittivity can be obtained with no need of any theoretical calculation or complex quantification procedure when the electric permittivity of one of the materials is known. To achieve these results the use of contact mode imaging is a key factor. For non-contact imaging modes the effects of the local sample thickness and of the imaging distance makes the interpretation of the capacitance images in terms of the electric permittivity properties of the materials much more complex. Present results represent a substantial contribution to the field of nanoscale microwave dielectric characterization of thin film materials with important implications for the characterization of novel 3D electronic devices and 3D nanomaterials. We show that the internal hydration properties of single Bacillus cereus endospores in air under different relative humidity (RH) conditions can be determined through the measurement of its electric permittivity by means of quantitative electrostatic force microscopy (EFM). We show that an increase in the RH from 0% to 80% induces a large increase in the equivalent homogeneous relative electric permittivity of the bacterial endospores, from ~4 up to ~17, accompanied only by a small increase in the endospore height, of just a few nanometers. These results correlate the increase of the moisture content of the endospore with the corresponding increase of environmental RH. 3D finite element numerical calculations, which include the internal structure of the endospores, indicate that the moisture is mainly accumulated in the external layers of the endospore, hence preserving the core of the endospore at low hydration levels. This mechanism is different from what we observe for vegetative bacterial cells of the same species, in which the cell wall at high humid atmospheric conditions is not able to preserve the cytoplasmic region at low hydration levels. These results show the potential of quantitative EFM under environmental humidity control to study the hygroscopic properties of small scale biological (and non-biological) entities and to determine its internal hydration state. A better understanding of nano-hygroscopic properties can be of relevance in the study of essential biological processes and in the design of bio-nanotechnological applications. We quantified the electric permittivity of single bacterial cells at microwave frequencies and nanoscale spatial resolution by means of near-field scanning microwave microscopy. To this end, calibrated complex admittance images have been obtained at ~19 GHz and analyzed with a methodology that removes the nonlocal topographic cross-talk contributions and thus provides quantifiable intrinsic dielectric images of the bacterial cells. Results for single Escherichia coli cells provide a relative electric permittivity of ~4 in dry conditions and ~20 in humid conditions, with no significant loss contributions. Present findings, together with the ability of microwaves to penetrate the cell membrane, open an important avenue in the microwave label-free imaging of single cells with nanoscale spatial resolution. Lift-mode electrostatic force microscopy (EFM) is one of the most convenient imaging modes to study the local dielectric properties of non-planar samples. Here we present the quantitative analysis of this imaging mode. We introduce a method to quantify and subtract the topographic crosstalk from the lift-mode EFM images, and a 3D numerical approach that allows for extracting the local dielectric constant with nanoscale spatial resolution free from topographic artifacts. We demonstrate this procedure by measuring the dielectric properties of micropatterned SiO 2 pillars and of single bacteria cells, thus illustrating the wide applicability of our approach from materials science to biology. We measured and quantified the local electric polarization properties of ultrathin (~ 5 nm) biolayers on mm-thick mica substrates. We achieved it by scanning a sharp conductive tip (< 10 nm radius) of an electrostatic force microscope over the biolayers and quantifying sub-picoNewton electric polarization forces with a sharp-tip model implemented using finite-element numerical calculations. We obtained relative dielectric constants ?r = 3.3, 2.4 and 1.9 for bacteriorhodopsin, dioleoylphosphatidylcholine (DOPC) and cholesterol layers, chosen as representative of the main cell membrane components, with an error below 10% and a spatial resolution down to ~ 50 nm. The ability of using insulating substrates common in biophysics research, such as mica or glass, instead of metallic substrates, offers both a general platform to determine the dielectric properties of biolayers and a wider compatibility with other characterization techniques, such as optical microscopy. This opens up new possibilities for biolayer research at the nanoscale, including nanoscale label-free composition mapping. Abstract Here, we devise a conductive Atomic Force Microscope (C-AFM) based on quartz tuning forks (QTFs) and metallic tips capable of simultaneously imaging the topography and conductance of a sample with nanoscale spatial resolution. The system is based on a header design which allows the metallic tip to be placed in tight and stable mechanical contact with the QTF without the need to use any glue. This allows electrical measurements to be taken with an electrically excited QTF with the two prongs free. The amplitude oscillation of the QTF is used to control the tip-sample distance and to acquire the topographic images. Meanwhile, the metallic tip is connected to a currentâ€“voltage amplifier circuit to measure the tip-sample field emission/tunneling current and to produce the conductive images. This method allows decoupled electrical measurement of the topography and electrical properties of the sample. The results we obtain from calibration samples demonstrate the feasibility of this measurement method and the adequacy of the performance of the system. The electric polarizability of DNA, represented by the dielectric constant, is a key intrinsic property that modulates DNA interaction with effector proteins. Surprisingly, it has so far remained unknown owing to the lack of experimental tools able to access it. Here, we experimentally resolved it by detecting the ultraweak polarization forces of DNA inside single T7 bacteriophages particles using electrostatic force microscopy. In contrast to the common assumption of low-polarizable behavior like proteins (εr ~ 2–4), we found that the DNA dielectric constant is ~ 8, considerably higher than the value of ~ 3 found for capsid proteins. State-of-the-art molecular dynamic simulations confirm the experimental findings, which result in sensibly decreased DNA interaction free energy than normally predicted by Poisson–Boltzmann methods. Our findings reveal a property at the basis of DNA structure and functions that is needed for realistic theoretical descriptions, and illustrate the synergetic power of scanning probe microscopy and theoretical computation techniques. Mechanical properties of nano-sized vesicles made up of natural membranes are crucial to the development of stable, biocompatible nanocontainers with enhanced functional, recognition and sensing capabilities. Here we measure and compare the mechanical properties of plasma and inner membrane nanovesicles âˆ¼80 nm in diameter obtained from disrupted yeast Saccharomyces cerevisiae cells. We provide evidence of a highly deformable behaviour for these vesicles, able to support repeated wall-to-wall compressions without irreversible deformations, accompanied by a noticeably high Young's modulus (âˆ¼300 MPa) compared to that obtained for reconstituted artificial liposomes of similar size and approaching that of some virus particles. Surprisingly enough, the results are approximately similar for plasma and inner membrane nanovesicles, in spite of their different lipid compositions, especially on what concerns the ergosterol content. These results point towards an important structural role of membrane proteins in the mechanical response of natural membrane vesicles and open the perspective to their potential use as robust nanocontainers for bioapplications. We investigate the effects of Cholesterol (Chol) in the structural and nanomechanical properties of binary and ternary spin-coated single lipid bilayers made of Dioleoylphosphatidylcholine (DOPC) and Sphingomyelin (SM) in dry conditions. We show that for the DOPC/Chol bilayers, Chol induces an initial increase of the bilayer thickness, followed by decrease for concentrations above 30% Chol. The mechanical properties, instead, appear practically insensitive to the Chol content. For the SM/Chol bilayers we have observed both the thinning of the bilayer and the decrease of the force necessary to break it for Chol content above 40. mol%. In both binary mixtures phase separation is not observed. For ternary single bilayers of DOPC/SM/Chol, Chol induces phase segregation and the formation of domains resembling lipid rafts. The domains show a thickness and mechanical response clearly distinct from the surrounding phase and dependent on the relative Chol content. Based on the results obtained for the binary mixtures, DOPC- and SM-enriched domains can be identified. We highlight that many of the effects of Chol reported here for the dry multicomponent single lipid bilayers resemble closely those observed in hydrated bilayers, thus offering an additional insight into their properties. We present a procedure for calibrated complex impedance measurements and dielectric quantification with scanning microwave microscopy. The calibration procedure works in situ directly on the substrate with the specimen of interest and does not require any specific calibration sample. In the workflow tip-sample approach curves are used to extract calibrated complex impedance values and to convert measured S11 reflection signals into sample capacitance and resistance images. The dielectric constant of thin dielectric SiO2 films were determined from the capacitance images and approach curves using appropriate electrical tip-sample models and the Îµr value extracted at f = 19.81 GHz is in good agreement with the nominal value of Îµr âˆ¼ 4. The capacitive and resistive material properties of a doped Si semiconductor sample were studied at different doping densities and tip-sample bias voltages. Following a simple serial model the capacitance-voltage spectroscopy curves are clearly related to the semiconductor depletion zone while the resistivity is rising with falling dopant density from 20 Î© to 20 kÎ©. The proposed procedure of calibrated complex impedance measurements is simple and fast and the accuracy of the results is not affected by varying stray capacitances. It works for nanoscale samples on either fully dielectric or highly conductive substrates at frequencies between 1 and 20 GHz. Electrostatic force microscopy (EFM) probes are typically coated in either metal (radius ~ 30 nm) or highly-doped diamond (radius ~ 100 nm). Highly-doped silicon probes, which offer a sharpened and stable tip apex (radius ~ 1–10 nm) and are usually used only in standard atomic force microscopy, have been recently shown to allow enhanced lateral resolution in quantitative EFM and its application for dielectric constant measurement. Here we present the theoretical modelling required to quantitatively interpret the electrostatic force between these sharpened tips and samples. In contrast to a sphere-capped cone geometry used to describe metal/diamond-coated tips, modelling a sharpened silicon tip requires a geometry comprised of a cone with two different angles. Theoretical results are supported by experimental measurements of metallic substrates and ~10 nm radius dielectric nanoparticles. This work is equally applicable to EFM and other electrical scanned probe techniques, where it allows quantifying electrical properties of nanomaterials and 3D nano-objects with higher resolution. Here we describe a high-throughput impedance flow cytometer on a chip. This device was built using compact and inexpensive electronic instrumentation. The system was used to count and size a mixed cell sample containing red blood cells and white blood cells. It demonstrated a counting capacity of up to ~500Â counts/s and was validated through a synchronised high-speed optical detection system. In addition, the device showed excellent discrimination performance under high-throughput conditions. We report a novel fabrication process for the batch fabrication of insulated conductive scanning probe microscopy (SPM) probes for electrical and topographic characterization of soft samples in liquid media at the nanoscale. The whole SPM probe structure is insulated with a dielectric material except at the very tip end and at the contact pad area to minimize the leakage current in liquid. Additionally, the geometry of the conducting layer in the probe cantilever and substrate is engineered to reduce the parasitic capacitance coupling with the sample. The electrical characterization of the probes has shown that parasitic capacitances are significantly reduced as compared to fully metallized cantilevers. An array of well-ordered conducting polypyrrole microrings doped with cobaltabisdicarbollide [Co(C2B9H11) 2]- anions was fabricated by means of electropolymerization and submerged micro-contact printing techniques. The different conductive properties of the micropatterned thiols acted as a template for directing the electrochemical 3D growth of the microstructures over large areas. X-ray photoelectron spectroscopy characterization confirmed the presence of this unusual doping anion within the polymer. Its intrinsic properties together with hydrophobic interactions with the thiols guided the formation of the ring structures. A topographic study by atomic force microscopy gave insights into the PPy/[Co(C2B9H11) 2]- growing mechanism which is in agreement with the theoretical model of metal growth. Finally, the conductive properties of the microstructures were addressed by conductive-atomic force microscopy, showing a highly conductive behaviour. This methodology using cobaltabisdicarbollide as dopant anion could have important applications in organic microelectronics for the development of biosensors, in cell microarrays and for the fabrication of polymer-based microencapsulators. We present what is, to our knowledge, the first experimental demonstration of dielectric constant measurement and quantification of supported lipid bilayers in electrolyte solutions with nanoscale spatial resolution. The dielectric constant was quantitatively reconstructed with finite element calculations by combining thickness information and local polarization forces which were measured using an electrostatic force microscope adapted to work in a liquid environment. Measurements of submicrometric dipalmitoylphosphatidylcholine lipid bilayer patches gave dielectric constants of Îµr âˆ¼ 3, which are higher than the values typically reported for the hydrophobic part of lipid membranes (Îµr âˆ¼ 2) and suggest a large contribution of the polar headgroup region to the dielectric response of the lipid bilayer. This work opens apparently new possibilities in the study of biomembrane electrostatics and other bioelectric phenomena. We analyze by means of finite-element numerical calculations the polarization force between a sharp conducting tip and a non-spherical uncharged dielectric nanoparticle with the objective of quantifying its dielectric constant from electrostatic force microscopy (EFM) measurements. We show that for an oblate spheroid nanoparticle of given height the strength of the polarization force acting on the tip depends linearly on the eccentricity, e, of the nanoparticle in the small eccentricity and low dielectric constant regimes (1 < e < 2 and 1 < Îµr; < 10), while for higher eccentricities (e > 2) the dependence is sub-linear and finally becomes independent of e for very large eccentricities (e > 30). These results imply that a precise account of the nanoparticle shape is required to quantify EFM data and obtain the dielectric constants of non-spherical dielectric nanoparticles. Experimental results obtained on polystyrene, silicon dioxide and aluminum oxide nanoparticles and on single viruses are used to illustrate the main findings. A theoretical analysis of amplitude modulated electrostatic force microscopy (AM-EFM) in liquid media at MHz frequencies, based on a simple tipâ€“sample parallel plate model, is presented. The model qualitatively explains the main features of AM-EFM in liquid media and provides a simple explanation of how the measured electric forces are affected by: the frequency of the applied voltage, the tipâ€“sample distance, the ionic concentration, the relative dielectric constant of the solution, and the relative dielectric constant and thickness of the sample. These results provide a simple framework for the design of AM-EFM measurements for localized dielectric characterization in liquid media. We show that optical visualization of ultrathin mica flakes on metallic substrates is viable using semitransparent gold as substrates. This enables to easily localize mica flakes and rapidly estimate their thickness directly on gold substrates by conventional optical reflection microscopy. We experimentally demonstrate it by comparing optical images with atomic force microscopy images of mica flakes on semitransparent gold. Present results open the possibility for simple and rapid characterization of thin mica flakes as well as other thin sheets directly on metallic substrates. Label-free detection of the material composition of nanoparticles could be enabled by the quantification of the nanoparticles’ inherent dielectric response to an applied electric field. However, the sensitivity of dielectric nanoscale objects to geometric and non-local effects makes the dielectric response extremely weak. Here we show that electrostatic force microscopy with sub-piconewton resolution can resolve the dielectric constants of single dielectric nanoparticles without the need for any reference material, as well as distinguish nanoparticles that have an identical surface but different inner composition. We unambiguously identified unlabelled ~10unm nanoparticles of similar morphology but different low-polarizable materials, and discriminated empty from DNA-containing virus capsids. Our approach should make the in situ characterization of nanoscale dielectrics and biological macromolecules possible. Natural vesicles produced from genetically engineered cells with tailored membrane receptor composition are promising building blocks for sensing biodevices. This is particularly true for the case of G-protein coupled receptors (GPCRs) present in many sensing processes in cells, whose functionality crucially depends on their lipid environment. However, the controlled production of natural vesicles containing GPCRs and their reproducible deposition on biosensor surfaces are among the outstanding challenges in the road map to realize practical biomolecular devices based on GPCRs. In this work we present the production and characterization of membrane nanovesicles from Saccharomyces cerevisiae containing heterologously expressed olfactory receptors - a member of the family of GPCRs - and study their deposition onto substrates used as biosensor supports. We show by direct observation with Atomic Force Microscopy that nanovesicles deposit and flatten without rupturing on glass substrates following approximately a diffusive law. We show that surface coverages larger than 20-25% of the substrate can be reproducibly achieved under practical nanovesicle concentrations and reasonable time scales, while keeping to the minimum the presence of background residuals coming from the nanovesicles production process. Surface chemistry modification of gold substrates indicates a higher affinity of natural nanovesicles for acid modified surfaces as compared to amino or alcohol modified surfaces. Present results constitute an important step in the practical realization of biosensor devices based on natural nanovesicles integrating G-protein coupled membrane receptors. We present a systematic analysis of the effects that the microscopic parts of electrostatic force microscopy probes (the cone and cantilever) have on the electrostatic interaction between the tip apex and thick insulating substrates (thickness>100mum). We discuss how these effects can influence the measurement and quantification of the local dielectric constant of the substrates. We propose and experimentally validate a general methodology that takes into account the influence of the cone and the cantilever, thus enabling us to obtain very accurate values of the dielectric constants of thick insulators. We present the implementation of dynamic electrostatic force microscopy in liquid media. This implementation enables the quantitative imaging of local dielectric properties of materials in electrolyte solutions with nanoscale spatial resolution. Local imaging capabilities are obtained by probing the frequency-dependent and ionic concentration-dependent electrostatic forces at high frequency (>1 MHz), while quantification of the interaction forces is obtained with finite-element numerical calculations. The results presented open a wide range of possibilities in a number of fields where the dielectric properties of materials need to be probed at the nanoscale and in a liquid environment. We present the experimental demonstration of low-frequency dielectric constant imaging of single-layer supported biomembranes at the nanoscale. The dielectric constant image has been quantitatively reconstructed by combining the thickness and local capacitance obtained using a scanning force microscope equipped with a sub-attofarad low-frequency capacitance detector. This work opens new possibilities for studying bioelectric phenomena and the dielectric properties of biological membranes at the nanoscale. A simple method to measure the static dielectric constant of thin films with nanometric spatial resolution is presented. The dielectric constant is extracted from DC electrostatic force measurements with the use of an accurate analytical model. The method is validated here on thin silicon dioxide films (8 nm thick, dielectric constant approximately 4) and purple membrane monolayers (6 nm thick, dielectric constant approximately 2), providing results in excellent agreement with those recently obtained by nanoscale capacitance microscopy using a current-sensing approach. The main advantage of the force detection approach resides in its simplicity and direct application on any commercial atomic force microscope with no need of additional sophisticated electronics, thus being easily available to researchers in materials science, biophysics and semiconductor technology. This article presents the fabrication and characterisation of a high-speed detection micro-Coulter counter with two-dimensional (2D) adjustable aperture and differential impedance detection. The developed device has been fabricated from biocompatible and transparent materials (polymer and glass) and uses the principle of hydrodynamic focusing in two dimensions. The use of a conductive solution for the sample flux and non-conductive solutions for the focalising fluxes provides an adjustable sample flow where particles are aligned and the resistive response concentrated, consequently enhancing the sensitivity and versatility of the device. High-speed counting of 20 mu m polystyrene particles and 5 mu m yeast cells with a rate of up to 1000 particles/s has been demonstrated. Two-dimensional focusing conditions have been used in devices with physical cross-sectional areas of 180 mu m x 65 mu m and 100 mu m x 43 mu m, respectively, in which particles resulted undetectable in the absence of focusing. The 2D-focusing conditions have provided, in addition, increased detection sensitivity by a factor of 1.6 as compared to 1 D-focusing conditions. We present an analytical model to interpret nanoscale capacitance microscopy measurements on thin dielectric films. The model displays a logarithmic dependence on the tip-sample distance and on the film thickness-dielectric constant ratio and shows an excellent agreement with finite-element numerical simulations and experimental results on a broad range of values. Based on these results, we discuss the capabilities of nanoscale capacitance microscopy for the quantitative extraction of the dielectric constant and the thickness of thin dielectric films at the nanoscale. A novel microfluidic chip able to detect a wide range of different cell sizes at very high rates is reported. The device uses two-dimensional hydrodynamic focusing  of the sample (conducting) flow by three non-conducting flows and high-speed differential impedance detection electronics. High-speed counting of 15Î¼m polystyrene particles and 5Î¼m yeast cells with a rate of up to 1000 particles/s has been demonstrated. Using of two-dimensional focusing effect turn out to be essential in a device with very large cross-sectional area (100x43 Î¼m2) in which particles result undetectable in the absence of focusing.